Proprietor Sophia Chang at the Kitchener Snack Bar window. 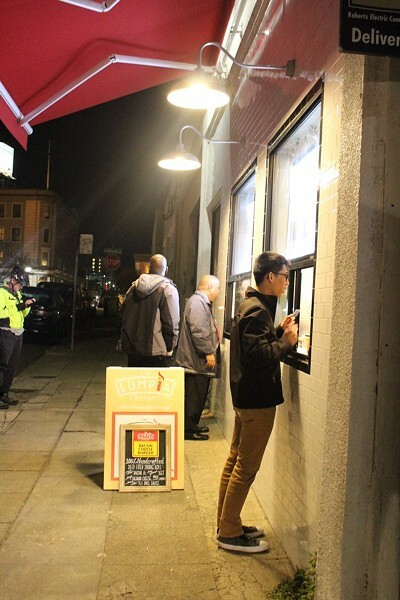 After a two-and-a-half-year delay, Uptown Oakland will finally get the snack bar it has been waiting for — a rather unorthodox takeout window that aims to be a boon to late-night sweets-cravers and grab-and-go lunch-eaters, and, most particularly, to a group of small-scale food entrepreneurs. The snack bar was open for business on a trial basis during a recent First Friday. 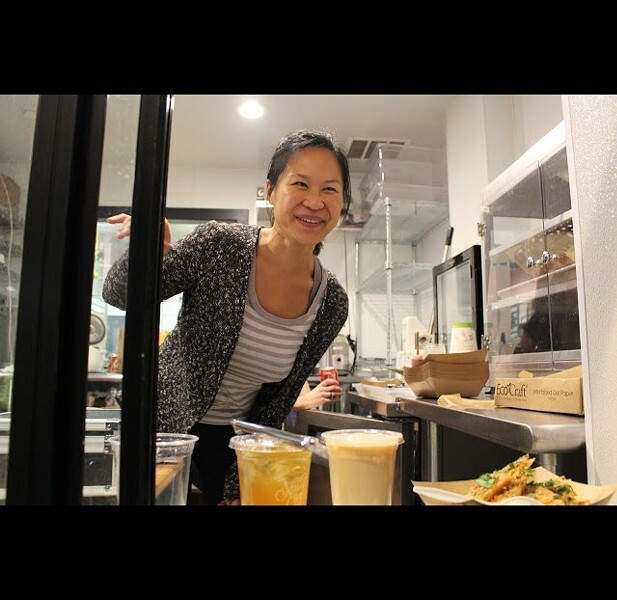 Dubbed the Kitchener Snack Bar, the takeout window will have a rotating schedule featuring many of the 25 food artisans who base their businesses at Kitchener Oakland (372 24th St., Oakland), a commercial kitchen and food-business incubator. According to proprietor Sophia Chang, the snack bar component of the business will officially launch sometime around the beginning of 2017, though it will open on a limited basis starting this week. When Chang first announced her plans in 2014, I touted the snack bar as having the potential to be the most innovative food-business model to hit the Bay Area since Guest Chef — the now-shuttered Rockridge restaurant that hosted a never-ending rotation of pop-up kitchens headed by both professional and amateur chefs who might not have the financial wherewithal to open a place of their own. In the intervening years, the demand for low-overhead brick-and-mortar opportunities for chefs and bakers has only gotten stronger. As commercial real estate prices creep up, the pop-up continues to be one of the only viable models for fledgling food businesses. A few places, such as the cafe component of the co-working space Forage Kitchen, have followed Guest Chef’s lead in terms of giving a rotating schedule of chefs full run of the place — essentially, a restaurant of their own — for longer than just a couple of nights at a time. Even more than some of these other models, the Kitchener Snack Bar occupies a hybrid middle ground. It isn’t permitted to operate as a restaurant, but rather as a snack bar, which means the food has to be cooked ahead of time in the commercial kitchen (located just a few steps away) and then reheated if necessary. More to the point, many of the food artisans at Kitchener aren’t aspiring restaurateurs per se. They might specialize in a particular type of cookie or savory pastry. Their eventual goal might be to open a brick-and-mortar bakery or a retail shop. In that context, the snack bar serves as the ideal next step from the wholesale business that many of them have been focusing on so far. For instance, Natalie Pearce, the proprietor of Natty Cakes, which has been based at Kitchener for the past two years, said that her long-term goal is to open a storefront bakery. But right now, the bulk of her business consists of special orders — wedding cakes, birthday cakes, and so forth. “The gap between what I’m doing right now and a storefront — there’s an ocean between it,” Pearce said. Natty Cake's Natalie Pearce serves a customer. 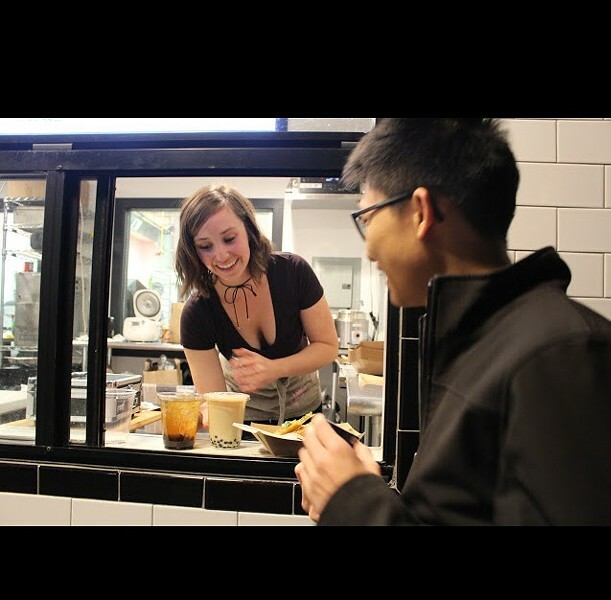 So, Pearce has signed up to be, in her words, the first “guinea pig”: Starting on December 8, she’ll set up at Kitchener Snack Bar every Thursday, 11 a.m.–4 p.m., offering French-style baguette sandwiches, house-made boba drinks, and a variety of baked treats. Eventually, once she has established a steady base of lunch customers, she would like to offer “high tea boxes,” which would include a crustless sandwich, a salad, a scone, clotted cream, and tea. Her hope is that the snack bar will give her valuable experience in terms of developing a menu and actually have face-to-face interactions with customers who might come to her on a daily or weekly basis — something she doesn’t really have right now. Natty Cakes will run the initial soft launch on its own, but eventually the snack bar program will be piloted by seven of Kitchener’s long-term food artisans. These include The Lumpia Company, Chica (whose restaurant in the former Aztecali space on Oakland Avenue is opening next week), Natty Cakes, Tart Oakland, Plate Craft, The Pie Shop, and Stroopie Gourmet. The idea is for two artisans to set up side-by-side during each time slot — breakfast, lunch, dinner, and late-night. Natty Cakes and The Lumpia Company also plan to make their food available for delivery via Uber Eats. According to Chang, the main reason for the long delay is that the snack bar project ended up costing a lot more than she’d initially expected — more than three times the amount she was able to raise with her initial $25,000 crowdfunding campaign. “We bootstrapped the rest of it,” Chang said.